A Story of Children and Film sees critic turned filmmaker Mark Cousins explore some of the many, many ways childhood has been portrayed in cinema. As the title indicates, this is a sort of spin-off to Cousin's epic 15-hour documentary (and accompanying book) A Story of Film, which boldly and surprisingly successfully attempted to celebrate the vast history of moviemaking. A Story of Children... is a more focused affair, but this 'essay film' illustrates Cousins' impressive critical faculties and dizzying knowledge of the medium as he provides fascinating analysis of trends, themes and aesthetics over elegantly chosen clips from a wide range of films. At the outset Cousins explains he will largely stick to more obscure and forgotten greats - although there are a few pitch perfect inclusions like E.T. - and he provides all but the most avid cinephile with a range of fascinating looking films from around the world to seek out. Tying all the clips together is footage of Cousins' own making - predominantly a single static shot of his young niece and nephew playing, and clips from his trip to the Scottish countryside. This helps create a compelling associative and expressive editing structure, making this a cinematic poem as much as an essay film. I'm still not the biggest fan of Cousins' unusually enunciated voiceover work, but this is a beautifully crafted ode to, yes, children in film, as well as a celebration of the boundless potential of the medium itself. Finsterworld (dir. Frauke Finsterwalder) initially suffers from many of the problems that inevitably plague any film that offers a dozen or so main characters. It's an assault of subnarratives and elusively characterised protagonists, and initially at least seems content to be a faintly quirky comedy-drama. But, as we adjust to the script's intentions (it's co-written by Finsterwalder's husband, novelist Christian Kracht), it opens up into something considerably more intriguing. As well as taking the characters' stories in notably darker directions as they progress, Finsterworld reveals itself as a film about critiques contemporary Germany, addressing many issues of national identity (the ruins of a concentration camp is one of the film's key settings) and social changes. This ties in with how the film explores characters in search of their own identity, with the film offering both optimistic and pessimistic endings - as well as some that exist somewhere in the middle - for its various protagonists. One of said protagonists is a policeman / 'closeted' furry - what at first seems like a fairly throwaway moment of quirk actually goes on to offer some of the film's most surprisingly poignant moments for both the man himself and his frustrated filmmaker girlfriend. Given its multi-perspective approach, the whole thing is undoubtedly uneven (one subplot that heavily features foot scrapings stands out as particularly awkward), but for the most part it's a surprisingly engaging and intelligently crafted film. Återträffen / The Reunion, from artist Anna Odell, is a film I've warmed to more in hindsight, although felt a tad underwhelmed actually watching it. The idea is absolutely inspired, one of the freshest I've come across recently. Odell stars as herself, and feels understandably spurned when she isn't invited to her school reunion. In response, she decides to stage a fictionalised version of the reunion itself, where she aggressively confronts her classmates about the isolation and bullying she experienced during her school days. The event gradually thrown into disarray, the whole thing plays out like an intense, uncomfortable and blackly comic riff on Festen. It makes for compellingly uncomfortable viewing. 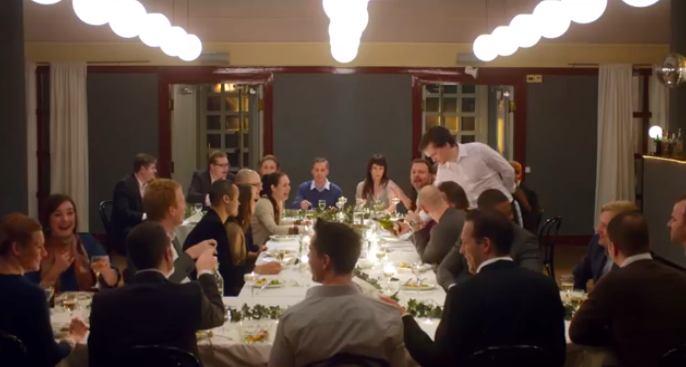 That's not the end of it, though, and the film goes in a unique direction when Odell opts to show the fictional reunion to her real-life classmates. This is an inspired decision, albeit one that feels a little awkward in implementation. The events, it seems, are based on the classmate's real-life reactions to the footage and Odell's attempts to contact them, but - for obvious reasons - they're recreated for our consumption. Naturally a documentary here would have basically shat on any ethical lines, but there's something underwhelming about seeing it all play out in controlled, recreated form. It lacks stylistic energy, barely ever leaping off the screen (the only overtly considered moment of cinematography - a lengthy aerial shot that marks the film's end - tellingly feels pointless and inconsistent after what we've just seen). It doesn't help that Odell herself is not the most natural or accomplished screen presence, her reserved, muttering performance meaning we lack a truly charismatic guide through this bizarre territory. It's perhaps for these reasons that, while watching, I felt removed from the whole experience, and I came out feeling as if the film's incredible potential had not been fully realised. But, as I reflect on it more, I do find myself having more respect for what Odell has managed here. The classmate's responses are regularly fascinating - some responding with confusion, others with thinly veiled embarrassment, some with desperate denial and - in the most interesting example, as Odell confronts a former classmate at his front door - one with undisguised indifference to Odell's confessed plight. Although I thought the film often danced on the border of excessive navel-gazing, Odell does admirably keep herself distant at times to allow the complexity of the responses speak for themselves. In the recreation footage particularly, she ensures that she's shown as aggressive and unreasonable as the most thuggish of her classmates, even if we're naturally inclined to side with her. It is considerably more than just an act of cinematic emotional vengeance. Mostly, however, the film serves as a thought-provoking indicator of how artists explore their own personal demons through art, with Odell confronting that vague territory head on and leaving much up to the viewer's own interpretations and conclusions. Perhaps that's precisely the reason why I appreciate The Reunion more after the fact. 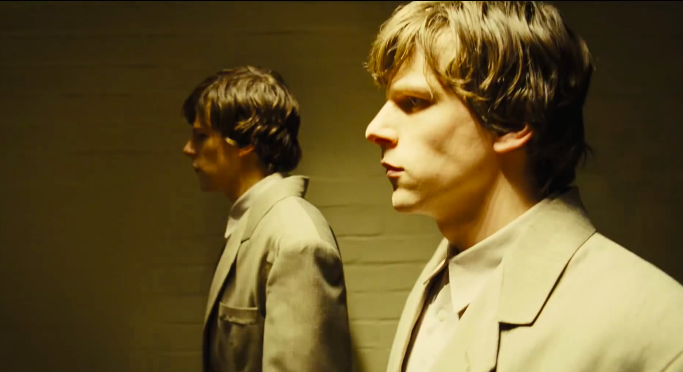 The Double is Richard Ayoade's sophomore feature, and it definitively marks him as a very exciting up-and-coming filmmaker (who would have thought Dean Learner had a true auteur in him?). This, I must confess, caught me off guard as I wasn't that fond of Submarine. Less obtuse than early reviews had led me to believe it was, The Double tackles often dark subject matter - it is, after all, a Dostoyevsky adaptation - with a knowingly playful touch. But it is a genuine joy to watch, Ayoade and his art, camera and lighting teams creating this giddily morbid, surrealistic dystopia - abstract in many ways, but with just enough familiarity to our own world to add an exaggerated contemporary relevance. With its almost robotic characters, steampunk machinery, intense yellow hues, absurd bureaucracy, overbearing shadows and eccentric rituals it's a deliriously oddball place to visit, but above all serves as an inspired setting for Ayoade's comedic stylings. There was something fairly predictable about the way it handled its central concept of a timid man (Jesse Eisenberg) encountering his bolder, arrogant, more charismatic double, with the people around him failing to spot the similarity. However more than enough psychological peculiarity and wit to keep us engaged. But then it was all realised with such visual panache and offers incredibly impressive soundscapes (what a brilliantly odd flourish to have all the music cues Japanese or Korean!). Eisenberg if not exactly stretching his scope fits in perfectly, and Mia Wasikowska is becoming an increasingly reassuring presence - has any recent young actress made such inspired career and collaboration decisions? Above all, though, it was wickedly deadpan and very funny. Despite Ayoade's assurance the only time the production team referenced Brazil was so that they could distance themselves from it, it's a far more successful successor to that film than the actual spiritual successor The Zero Theorem. There's much to like or at least admire about it - the wild cinematography and production design, the (sometimes) enjoyably cartoonish and very physical film world, plenty of interesting themes and singular delivery of the same. But, as has become sadly standard for Gilliam's film output over the last two decades, it's so relentlessly zany, haphazardly paced and insanely inconsistent that it frustrates as much as if not more than it impresses. Also a shame that the characters are so clinically presented for the first half of the film (that improves later on, to the point where a sudden empathy and emotional core seems actively jarring). I still think CGI hasn't been Gilliam's friend (well, besides financially) in realising his surrealistic visions - perhaps a result of watching The Double beforehand, but Gilliam's visual style here lacks coherence and is almost too artificial, even when the film is imagining a full-on virtual reality (an impossibly perfect beach at sunset plays a pivotal role throughout) or attempting to satirise the visual and aural overload many of us are subjected too these days. It's telling that it's the more physical creations - most obviously the radically altered church where the bulk of the action takes place - feel infinitely more pleasing than the hyperactive CG evident elsewhere. The cast members, led by a bald Christoph Waltz, are mostly game for insanity, but sadly are fighting an uphill battle against Gilliam's removed and clinical stylings. The story, meanwhile, toys with big ideas, but is too madly paced to register much of a pulse. It ends up hitting some darker beats, but it's much too busy. A finale that riffs on Brazil's iconic closing moments made me wish I was just watching that film instead. That said, Gilliam himself - like Ayoade, albeit in a very different way - was a delight to hear and see speak in person, and is still overflowing with enthusiasm and energy. Indeed, hearing him talk about the film so passionately and insightfully afterwards I was disappointed that I didn't enjoy it more than I actually did. But then, with only one or two exceptions (mostly Brazil), I think I always like the theory and idea of Gilliam's films more than I do actually watching them.